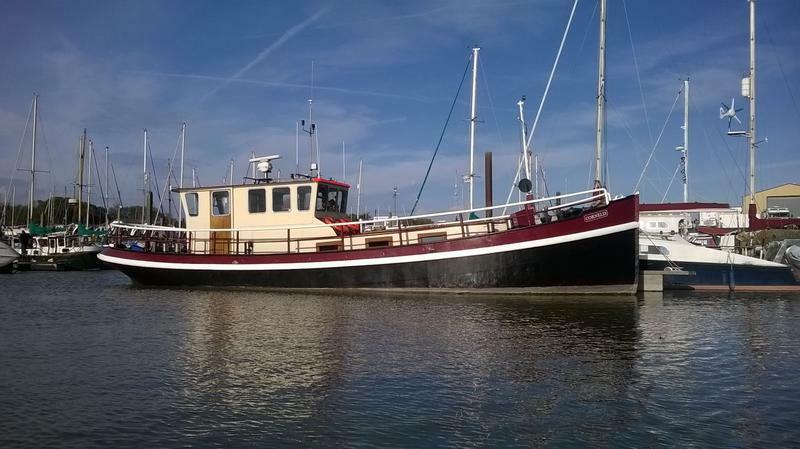 Premier Houseboats are pleased to present Cornelis, a beautiful dutch barge, lovingly converted and in full cruising condition. Cornelius had been converted to create comfortable living, with space throughout utilised to its full potential. Cornelis has been converted and finished to an extremely high standard, with great thought given to make the most of the space available, without impacting on her cruising ability. Storage has been cleverly built in wherever possible. Entrance is through the well equipped wheelhouse which also houses the galley. This area has been designed so that the galley has no negative impact on navigational ability. The galley has an LPG oven, microwave and fridge freezer, as well as ample storage and work surface. Steps lead down to a hallway, to your left as you walk down is the shower room, which has shower cubicle, toilet, hand basin and also houses the washing machine.Behind the steps down to the hallway is a double berth under the wheelhouse, and a storage area. The hallway leads to the saloon, which has built in seating, plenty of built in storage, and bespoke double glazed windows throughout for both light and air flow. Forward from this is a double cabin, with built in double berth and again plenty of built in storage. Cornelis has diesel fired central heating, a log burner, and gas heater for the shower. She is extremely well decorated throughout, with little or nothing needed to do before moving on. The wheelhouse is equipped with AIS, DSC, wheel, radar and radio. There is also a dinghy with Johnson 3.5 outboard that comes with the boat. Cornelis was lifted out in 2013 and surveyed, and was also panted, and is still in extremely good order externally. There is some nice deck space to enjoy your surroundings wherever you may find yourself. She is fully equipped to cruise both tidal and non tidal waterways. Overall, Cornelis is a superb example of a cruising home, economical to buy, run and moor, and together with the surprisingly comfortable living space she is a fine example of a cruising houseboat, and a great life changing opportunity. 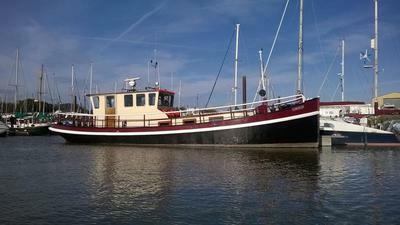 Vessel name: Cornelis Vessel condition: Good Year constructed: 1930 Year refitted: 2016 Berths: 4 Cabins: 2 Heads: 1 No. of engines: 1 Engine model: Deutz Engine power: 105 Length over all: 52' Beam: 12' Maximum draft: 4' Hull material: Iron Hull type: Other Hull colour: Black Disclaimer Premier Houseboats offers the details of this advert in good faith as it was presented by the seller or his representative but cannot guarantee or warrant the accuracy of this information nor warrant the condition of the described item within this advert. A buyer should instruct his agents, or his surveyors, to investigate such details as the buyer desires validated. The Item described within this advert is offered subject to prior sale, price change, or withdrawal without notice.